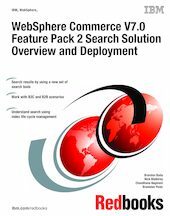 This IBM® Redbooks® publication focuses on the enhanced search capabilities of the newest release of IBM WebSphere Commerce V7.0 Feature Pack 2. We divided this book into three parts to highlight search business-to-consumer (B2C) and search business-to-business (B2B) use cases and a conceptual overview of the search solution. This book can help you to enable the search features of WebSphere Commerce V7.0 Feature Pack 2 and set up the WebSphere Commerce search environment, experience the design and management of Solr indexes, and experience several B2C scenarios using the Madisons Feature Pack 2 (FEP2) store. This book describes search index life-cycle management and examines each area, such as index building, synchronization, configuration, and replication. This book describes the entitlement feature that is provided through the WebSphere Commerce search framework. We also discuss a B2B use case and provide the implementation using catalog filters and contracts. This book is designed for use by WebSphere Commerce developers, practitioners, and solution architects in various industries.